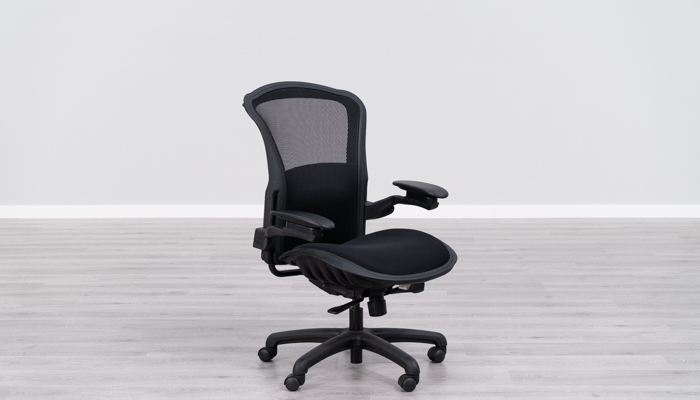 If you’re landing on this page, there is a good chance that you’ve decided to make an investment in a new office chair. The process of finding a new office chair isn’t always easy; after all, there are countless chairs and so many price points to consider. So, how do you know you’re getting the right chair for your needs? That’s where we come in. With over 13 years experience in the industry, we’ve got a pretty good idea of what to look for and what to avoid. Because of our vast knowledge, one of the things we wanted to do was eliminate any chairs that are offered for less than $199. In our experience, chairs at this price point tend to be too cheap and are better suited for a discount office chair post that we’ll cover at a later date. Like most things in life, you really do pay for what you get with office chairs. That doesn’t mean that you can’t find a really good chair under $500, but it does mean that you also can’t expect a $199 chair to be the same as what is available at $1,400. 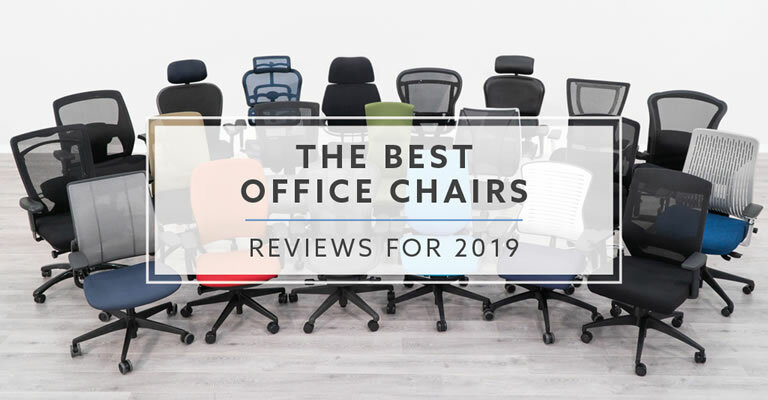 After completing our list, we are confident that you should be able to find a perfect chair in our top office chairs list for 2019. With that, let’s take a closer look at the results for this year’s best office chairs. Why trust The Learning Center? What is our testing process? How did we pick the best office chair for 2019? Why trust The Learning Center at BTOD.com? Simply put, we are experts. We have been selling office furniture for almost 13 years and have sold a wide range of office seating since our start in 2005. We are not a company that is simply dedicated to writing reviews on emerging markets in hopes of making a quick buck. Office furniture is our life and we have gained extensive knowledge about the products within our space. We know what to look for and what to avoid. Our goal is to share this knowledge so that customers are better informed when making their buying decision. One thing that really separates The Breakroom Blog from almost every other review site is that we bring in all of the products that we review. We do not do forensic reviews or reviews based on what other customers have said about the product. We order the product for ourselves so that we know how it performs. Some of the products we sell on BTOD.com, but many of them we do not. Regardless, we have tested every product we have reviewed. When you take a closer look at alternative review sites, this isn’t as common as it should be. The testing process for this list was straightforward, but like our other best-of lists, it was very thorough. 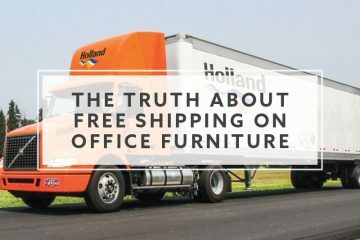 Since we purchased all of the office chairs we tested, we could get a better understanding of the entire process of ordering the chairs to the point we received them. Having the opportunity to fully assembly each office chair is important as well. If there are any pain points during the process we are able to document them. After the office chairs are put together we’re able to put them through the same testing process. We first check all of the specs of the chair and make sure that the adjustments function properly. We’re then able to start looking closer at things like build quality. While the testing process for one chair alone might be difficult to analyze when you put all 21 next to each other the differences are fairly obvious. In addition to our standard testing process, we also incorporated a new method for three testing categories which involved everyone in our office. Because office seating is such a unique experience to the individual, getting as many opinions as possible was important. Once the chairs began to arrive, we started to rotate them through all nine people in the office. We have a diverse group of individuals in our office, with five men and four women. They include heights ranging from 5’2” up to 6’3”, various weights and ages ranging from 23 up to 49. When you look at most offices, I believe we have a good group to base our findings on. Over the course of the next two months, everyone was able to use all 21 chairs to get a better feel for each. Starting in January, we did an office chair roundup. Each person was given a list of the chairs and asked to score the three most subjective things about the chair: seat comfort, back support and armrest comfort. With this information, we were able to average all the numbers for each category to get a better understanding of how most people feel about that particular aspect of the chair. 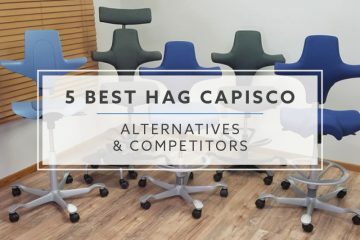 Understanding how to pick the best office chairs was the most difficult category that we’ve tackled to date. With so many body types to consider, it wasn’t as easy as just picking what we felt were the best based on our expertise in the category. Instead, for categories like the scope of users, we needed to look at how an office chair would fit the majority of the population within the 5th and 95th percentile. With this deeper thinking, we were able to rank office chairs we reviewed with an overall numbered score ranging from 1-100. The score is based on several categories that we chose. The categories below are what we feel to be the most important things to consider when shopping for a new office chair. Each category has its own 1-100 rating and each category has the same weight when calculating the overall score. One thing that you will notice with our scoring is that we are very realistic. There is no such thing as a perfect office chair and our scores reflect that. You will not find products with 100/100 ratings here because such a product doesn’t exist. Even the best office chair in our list scored 89/100, so we felt there is room for improvement in all of the products we tested. One of the first things we looked at was the overall build quality of the office chairs. Because the chairs we tested ranged from $199 up to $1,400, the differences in build quality were fairly obvious for most chairs. This category really showed us that you get what you pay for in the office chair category. The material used in an office chair was a major component for scoring build quality. Just because a product used plastic didn’t mean it was low quality. Some of the best office chairs incorporated high-quality plastics. They helped to keep a chairs weight down and provide extra flexibility in components like the backrest. Other materials used, like custom molded aluminum components for the arms, frames or mechanisms, scored better than standard steel components. Fit and finish was also a big part of the build quality scoring. How nicely plastic parts were molded was easy to see with the naked eye. Aluminum and steel finishes were scrutinized as well. If components like armrests or backrests had a cheap feel to them, which included poor connections, the build quality score was lowered. Lastly, we looked at the products upholstery and how nicely it was incorporated with the chair’s structure. One of the most difficult categories for us to score, the Scope of Users, was also one of the most important. In order to score chairs accurately in this category, Greg went through all 21 office chairs and remeasured them. We realized early on that manufacturer’s specs weren’t always accurate. Looking at the size and overall adjustment range for seat height, seat pan size, armrest height and width, back height and weight rating, we were able to accurately score based on the 5th and 95th percentile. To ensure we were getting accurate information, we had the tallest and shortest people in the office sit in various chairs. This gave us a better idea of how chair components would really fit for such a wide range of users. This category required us to meet several times, for hours at a time, to make sure we were comfortable with our results and how they scored. Since a lot of users don’t have the opportunity to try these products in person, getting the scope of users accurate was very important to us. This category is the first of three that we included the opinion from all nine users in our office. Seat comfort is one of the most subjective things on an office chair and getting as many opinions as possible was important to us for accurate scoring. In order to do this properly, we put all 21 chairs in our office and had users go between each scoring them during the same time period. Prior to scoring, all users had an opportunity, over the previous two months, to use each of the chairs. This gave a good baseline of expectations from chair to chair. It also helped to ensure users weren’t only giving their scores based on only a few minutes in each chair. While a lot can be determined in the first few minutes, it’s also good to give chairs a longer sit to see how they feel for an entire shift. Our overall seat comfort score is a good middle of the road rating that will give a good baseline for most users. If you are very specific about the seat firmness or softness, you will want to take a closer look at the review for that particular chair. Much like the seat comfort, back-support is also a subjective thing. How much support and where the support is will vary widely among users. For this score, we also used the average of nine users’ scores to come up with our final score. Getting this right is important; without good back support a chair could end up causing more harm than good. With 21 chairs, the difference between them was significant. While a lot of the chairs offered adjustable lumbar support, having an adjustable lumbar necessarily didn’t mean it was more comfortable. The highest back score by six points actually came from a chair with no adjustment in the back at all. However, the runner up offered multi-dimensional adjustment. Sometimes the best support can come from a naturally shaped backrest with the proper upholstery. This category was the last that we used the average of nine scores from users within the office. Like the seat, we wanted to get a good overall score for things like preferred softness or firmness in the arms. How the arms adjusted were important as well. When scoring the arms, we made sure that everyone understood how they adjusted. Not all arms are easy to figure out and not knowing an arm moves a certain way could impact its score significantly. Two major points for scoring were that you were able to adjust the arms to a comfortable working position. Secondly, how comfortable they were to rest your elbow and forearm on. Scoring for this category was different than all of our other categories. It’s important to note that all of the adjustments, with the exception of tilt lock, weren’t scored based on how adjustable it was. This was done to avoid overlap from the scope of users category. Instead, we created a point system for adjustments and weighted them based on importance. Lastly, we provided ten potential points for extras that didn’t fall into a normal adjustment category. Things like forward seat tilt, adjustable headrest or a weight activated mechanism fell into this category. Note: Only the tilt lock was based on how adjustable it was since this wasn’t scored in the scope of users section. For instance, chairs with infinite tilt lock scored all four points. A chair with only one locking position scored one point. The assembly score was pretty straight forward, with the least amount of assembly required scored the most points. If a chair shipped fully assembled it would score all 100 points. Chairs that only required you to attach a base and casters were only docked a small number of points. If the chair came completely knocked down, meaning all of the components needed to be attached, they generally received the fewest points. How easy each of these types of chairs were to put together impacted their assembly score as well. Overall, the higher-end chairs tended to ship fully assembled or close to. This gave them an advantage in the category since the most points were awarded to the chairs with the least amount of effort required for assembly. Like the assembly process, the higher-end chairs tended to have the best warranties. That didn’t mean that all of the high-end chairs had the same warranty though. Brands like Herman Miller and Steelcase were a cut above the rest. Our ranking process looked at all of the fine details in the warranty information. Not all brands make the information that easy to understand. It’s important to look at how long the warranty is and what aspects of the chair it covers. Things like mechanisms, casters, frames and arms are longer than upholstery and foam. Some office furniture brands make you cover shipping on parts as well, so it’s important to pay close attention here. The brands that offered the longest warranties, with no additional strings attached, scored the best here. While the two best warranties come with the most expensive chairs, you can rest assured that your chair will have excellent warranty support during your ownership of it. Inspired by a medical study conducted over the course of four years, 732 different users’ own experiences helped to create the Steelcase Leap chair. So much movement, in all the most important places, makes the Steelcase our favorite office chair for 2019. The Steelcase Leap chair has a lot going on, so much so that our short summary is unlikely to cover it all. Overall, the fit and finish of the Steelcase Chair was excellent. Don’t let the plastic be confused with lower quality. Providing flexibility in the backrest and seat, the high-quality plastics were all part of the overall design of the Leap chair. The Leap Chair is as dynamic as the adjustments it offers. With a flexible backrest that has separate upper and lower movement, you are able to get great support through a multitude of seated positions. It includes an adjustable lower lumbar tension control and adjustable upper thoracic control as well. Both adjustments allow you to fine-tune the backrest to your specific needs. 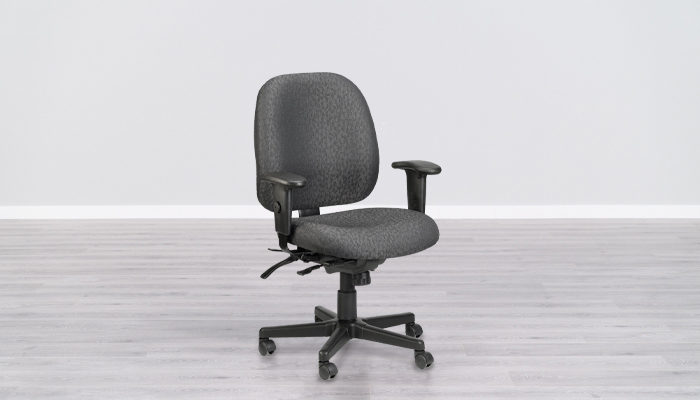 Highly adjustable arms, very good seat comfort and a wide range of additional ergonomic adjustments make this chair a great pick for most users. 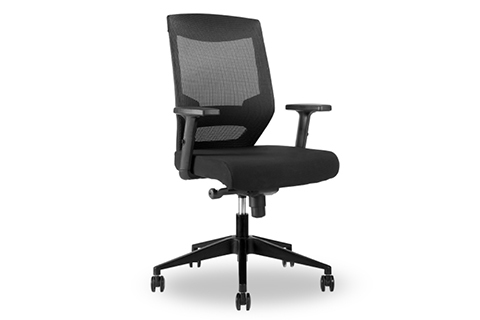 The Steelcase Leap chair ships fully assembled and comes with an excellent warranty as well. 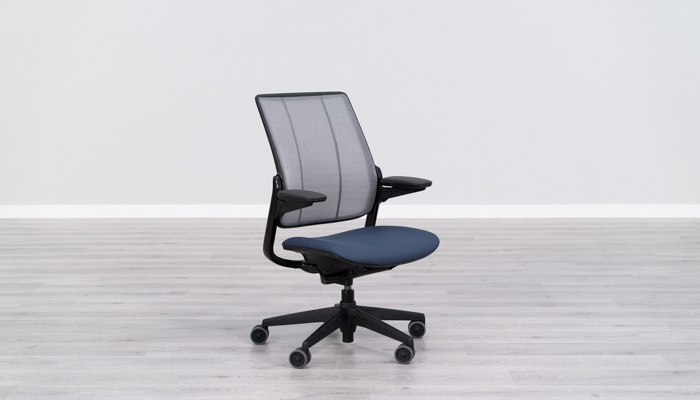 One of the few chairs in the list to not include a handful of things we didn’t like; the Steelcase Leap chair is about as close to perfect as you’ll find. That also means you’re going to have to pay for it too. With a price tag that is over $1000 in most configurations, the Leap chair will likely be out of budget for a lot of users. 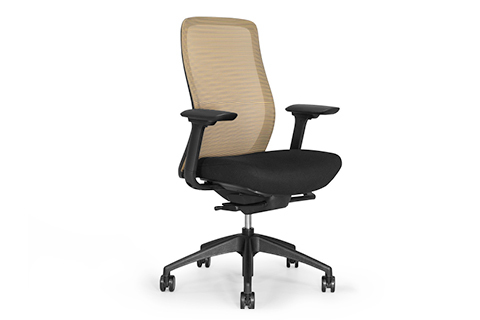 The Steelcase Leap chair is a fully loaded ergonomic chair, with almost every adjustment you could imagine. Because of the design and movement through the seat and back, they were unable to provide a height adjustable backrest. 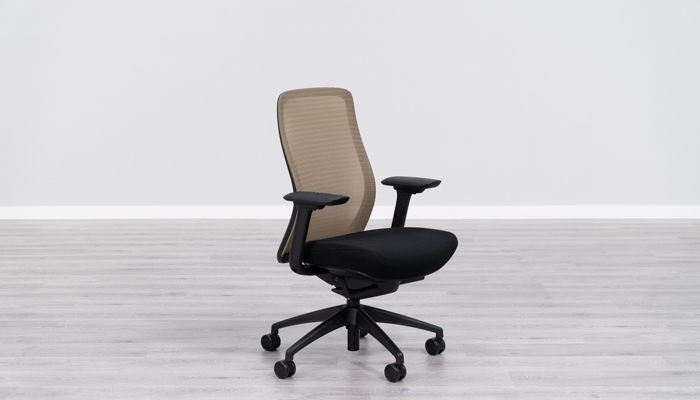 If you’re looking for a tall backrest, you will not find it with the Steelcase Leap. With the same score as the Leap chair, the Steelcase Gesture was also an excellent office chair. While they both scored the same overall, they were different chairs. One thing we learned about Steelcase is they put a ton of thought into their chairs and that was evident with the Steelcase Gesture. With a global posture study conducted observing over 2,000 users, the Steelcase Gesture was born. What they found through the study was that human posture had changed with all the new technology and devices available. At the foundation, the chair needed to be stable, yet flexible enough to provide support for today’s unique movement. The Steelcase Gestures 3D LiveBack and seat move in unison, creating a comfortable sitting position no matter how you move in the chair. Through our testing, it was obvious that Steelcase put scope of users at the top of their list of importance. This chair was so adjustable that it would have no problems fitting the 5th and 95th percentile of the population. If you like highly adjustable armrests, this chair had the most adjustable of any we tested. Regardless of your body type, you should able to comfortably position the arms, regardless of the task at hand. Like the Leap chair, Gesture offered very good seat comfort and a wide range of ergonomic adjustments to fine tune the fit to you. The Gesture ships fully assembled and comes with an excellent warranty. Outside of the high price tag, the Gesture chair didn’t have much not to like about it. With so much thought put into its design, we realized we’d have to be nitpicking to really make a knock at this product. Like the Leap chair, the Steelcase Gesture didn’t include a height adjustable backrest. With the design of the seat and back, this was not a viable option for them. Considering the amount of research done to create the Gesture, it would appear as though they don’t see this function as important as the others they have included with the chair. The Embody chair is a high-end ergonomic office chair that was designed by Bill Stumpf and Jeff Weber. It is made in the USA and comes with one of the best warranties in the industry. It features technology and styling that can only be found on this chair. Herman Miller conducted numerous studies and included the contributions from many different experts to design the Embody with ergonomics in mind. This chair feels smooth when you use it. The seat moves at a nice ratio compared to the back and the arms move with you as you recline, which keeps you in the same position at all stages of adjustment. The Embody’s Pixelated Support technology is one of the things that makes it so unique. There is a wide grid of pixels on the seat and back that will flex and conform to your specific body shape. This is meant to distribute pressure to keep you comfortable. It also provides a more breathable system than traditional foam. The last thing that we really like with the Embody is the independent back angle adjustment. This allows you to change the backrest angle so that it can be at a fully upright position. The Embody has a good natural lumbar curve but there is no adjustability. This may cause an issue if the lumbar curve does not fit you the way you would like it to. The arm pads also lack adjustability. The arms have a good height and width adjustment range but are the only adjustment options. It would be nice if the arm pads moved front to back and/or swiveled. This helps to make arms fit different desks, keyboard trays and typing styles better. The Embody comes in a decent range of colors but most of the options are in a polyester fabric. There is not an option to get the Embody in vinyl or leather. The final thing that may be a problem for some people is the Pixelated Support system. Some people in our office said they could feel the individual pixels more than they would have liked and would prefer a different chair model. The Aeron by Herman Miller debuted in 1994 and has since become one of the most recognizable chairs in the world. It was designed by Bill Stumpf and Don Chadwick and features one of the best build qualities we have seen on any office chair. It currently holds the highest build quality score we have given to a chair at 95/100. The chair comes standard with Herman Miller’s all-inclusive 12-year warranty. 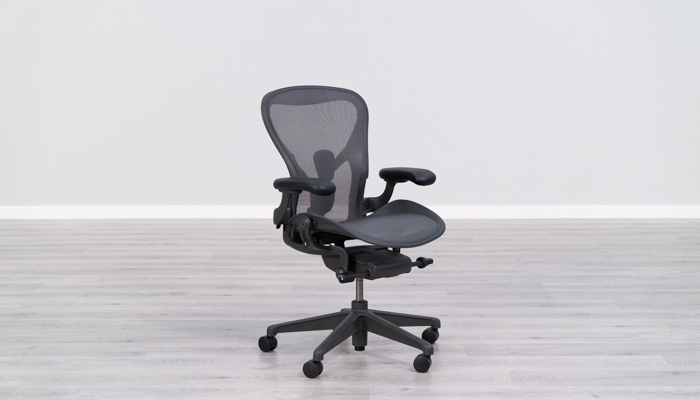 The Aeron was recently remastered with an updated mechanism, mesh upholstery and PostureFit lumbar system. One of the best things about the Aeron is that it has one of the smoothest rocking motions out of all the chairs we have tested. Some chairs have awkward moving seats when the back reclines. Not the Aeron. It feels natural to recline and rock on the Aeron. The arms stay in place and you are held in the same comfortable posture. The adjustable lumbar system is highly recommended. This will allow you to adjust the height of the lumbar. If you get the PostureFit SL, you can adjust the amount of pressure the lumbar support provides. Another cool feature on the Aeron is that you can get it with forward seat tilt. Forward seat tilt allows you to work at a more forward angle, which is often a preferred choice when tasking. This is a feature that is only seen on a few chairs on our list. One of the biggest problems with the Aeron is that there are three different chair sizes. This is good because the chair can accommodate more people, but it is also a downside because one single chair cannot accommodate a wide range of people. If you want a chair that will be shared between two or more people, of different body types and/or sizes, then the Aeron is not going to be a good option for you. The next potential downside is that the frame is very pronounced on the Aeron and there are times that you can feel it. If you lean side to side, you may be able to feel the side bolsters. There are also times that the front of the frame can be felt on the back of your legs. The top of the backrest frame may also be an issue if you lean back because it is not very comfortable to lean against. The Humanscale Freedom chair was designed by Niels Diffrient. His goal was to create a revolutionary office chair that was able to automatically adjust to anybody that sat in the chair. 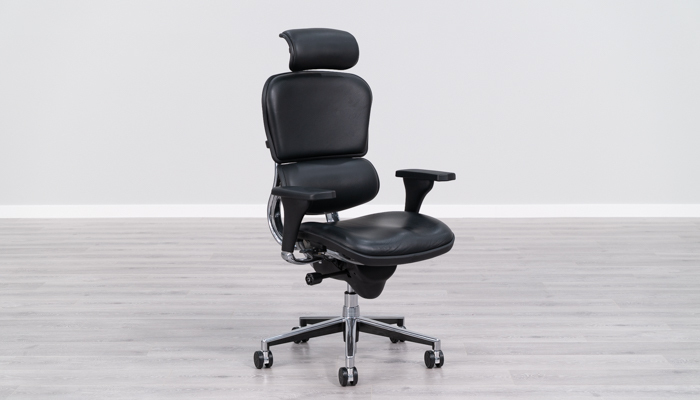 With its unique design, the Freedom chair includes a weight sensitive, self-locking recline mechanism that automatically adjusts the chair’s tension and recline position. That backrest also provides a pivoting function that helps to move with you as you shift in your chair. The Freedom Chair comes with most of the ergonomic adjustments you will need to be comfortable. Seat depth adjustment is included and will help to accommodate shorter and longer legs. The build quality of the Freedom was on the higher-end of the spectrum, with molded aluminum components throughout. The Freedom comes with a very good warranty and ships almost completely assembled. Even with the gel seat pad on our test model, the Humanscale Freedom’s seat pad only rated middle of the road for comfort. With a firm sit, it might not be ideal for users that want something soft and cushy. Like all other weight-activated tilt office chairs, the Freedom can take a little while to get used to. If you really like to be able to lock your chair in multiple positions, this type of mechanism might pose a problem. The Freedom Chair comes with height and width adjustable armrests. While the pads were comfortable, the arms only move up and down in unison. This means that both of your arms will always be at the same height. While this is nice if you’ve had issues getting both arms at the same height in the past, it can also pose an issue if you’re trying to vary their heights for other reasons. 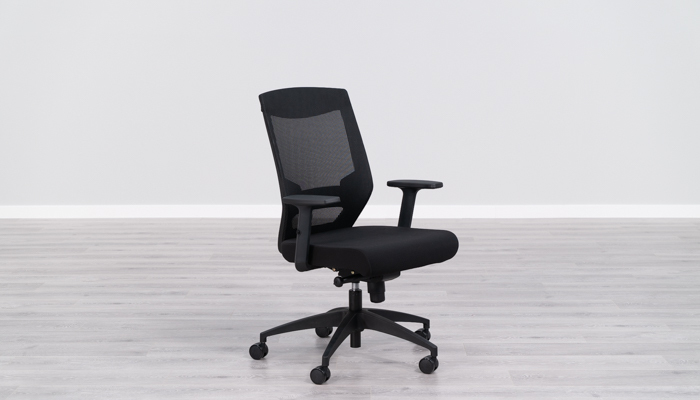 The CXO is a solid chair, overall. It does not have a big name designer or a one of a kind mechanism, but it does almost everything well. It is made in Canada with good build quality. It features a synchronous knee-tilt mechanism that allows you to rock back and forth smoothly. It comes in a wide range of upholstery options, including a full leather version. The CXO is also available in a couple of specialty versions to accommodate heavier people or 24/7 work environments. 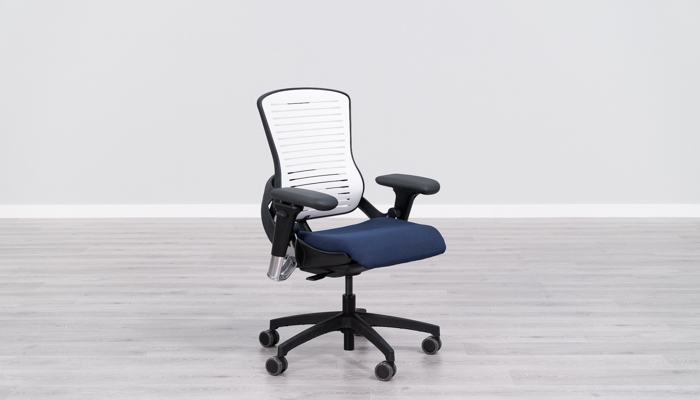 The CXO has good ergonomics, adjustable lumbar support and an optional headrest for people that like to kick back and relax. 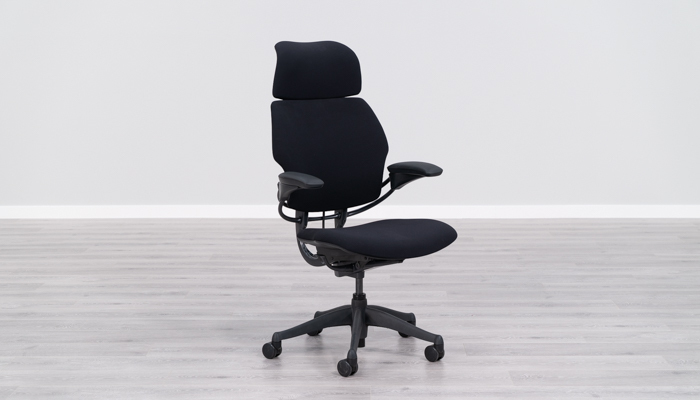 The seat on the CXO scored very well in our office poll, currently holding a top 4 rating in the category. The seat features thick padding called ENERSORB™. It is a memory foam that is designed to be breathable to keep you cool while you are working. It is soft and forms to the person using the chair. Overall, our office liked the seat but the ENERSORB™ foam is not going to be for everyone. Some people prefer a firm seat and others simply do not like memory foam. The next downside is that the headrest may not work for people under 5’3”. The headrest is meant to go in the curve of your neck. When you are too short, the headrest will push your head forward, which is uncomfortable. The CXO is not a good option for people over 6’1”. The headrest does not go high enough to fit properly. The backrest may be an issue because it has a thick frame that may come into contact with your back. 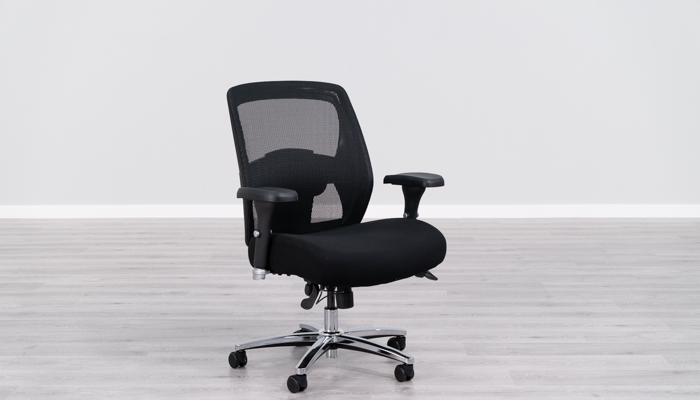 The Diffrient Smart chair is a mesh back task chair that was designed by Neils Diffrient. This product is for people that want a high-end task chair that is design focused. It is made in the USA with good quality components and comes with one of the best warranties out there. The Diffrient Smart features clean lines, a minimalist design and a variety of color combinations. It also features a unique “mechanism-free” recline that automatically adjusts to the weight of the person using the chair. 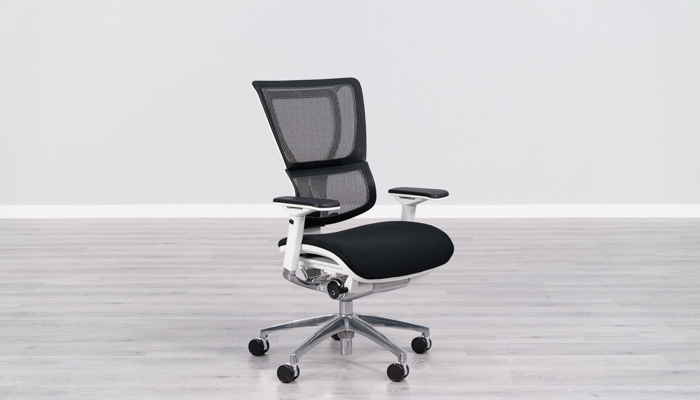 The backrest is made from Humanscale’s Form-Sensing Mesh Technology and is designed to provide automatic lumbar support. The mesh has a tri-panel system that helps it to conform to the specific person using the chair. The Diffrient Smart Chair’s backrest tested well in our office. It was rated as one of the most comfortable backrests on this list. The seat is another area that tested well in our office. It was voted in the top tier for seat comfort. It features 2” of high-end padding and has a contoured shape. The Diffrient Smart was intentionally designed with very few adjustments. The idea is that you can get into the chair and have the chair adapt to you. This can be a downside though. There is no backrest or lumbar adjustments on this chair. The Diffrient Smart also lacks tilt lock or tilt tension adjustments. You have very little control over the adjustability of the chair. The next aspect that may be an issue for some people is the reclining function. This is not a chair that rocks naturally like the Embody or Aeron. Instead, the back of the seat tilts up slightly as you recline. This is to help keep your hips at a more open angle when you lean back. This feeling is not going to be for everyone. The Truly., by OM, was designed by Francisco Romero. It features a TruFit™ Polyback backrest. It is meant to respond to the shape and weight of the person using the chair to provide proper support. The backrest has vertical slots that allow good airflow to keep you from getting warm in the chair. We chose to go with the Executive Synchro mechanism, and it has a nice rocking motion. The chair feels natural to recline in. The area that the Truly. really excels in is its ergonomic adjustability. The backrest is fully adjustable. It is height adjustable and it also has independent back angle adjustment, which is a really nice feature for people that like to sit straight up at their desk. The lumbar is also adjustable to be more or less pronounced based on your preference. Along with a really adjustable backrest, you also get arms that are highly adjustable. They are adjustable enough to accommodate almost any position desired. There are two areas with the Truly. that could pose problems for some people. The first is that the Polyback material used for the backrest will not be liked by everyone. Even though the Truly. has one of the most adjustable backs on this list, it didn’t receive a good back score. Our office was split in half on back comfort. Half really liked it and half didn’t care for it. If you are not a fan of the plastic backrest feel, then I would recommend upgrading to the upholstered back. The second potential issue is that the seat may be a bit firm for some people. The seat comfort category turned out a lot like the backrest. Some people in our office liked the seat but it did receive a couple really low scores too and that was because some felt the seat was a bit too firm. The OM5 by Office Master is a chair that was designed by Francisco Romero. It features a flexible, PolyFlex backrest that has a pronounced lumbar curve built-in. The slots in the backrest are designed to keep you cool and they also help the back to flex in a way that conforms to you. The OM5 has an adjustment system that Office Master calls Body-Activated Motion. This system allows the backrest to recline freely. When the back reclines, the seat moves out and up, which helps to keep you in a good posture. 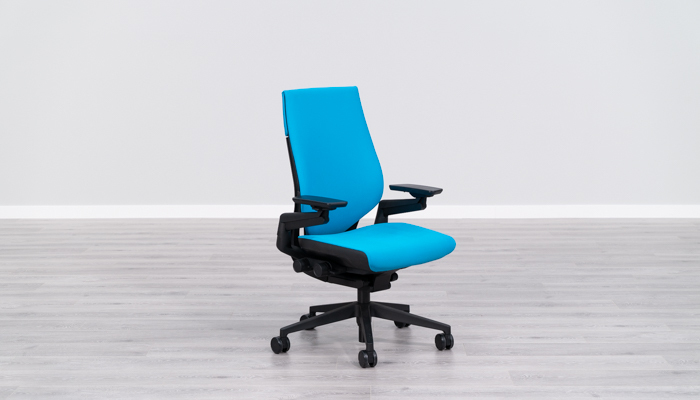 The OM5 comes with a variety of different back, cylinder and arm options, so this chair will fit a wide range of people. The OM5 arms are highly adjustable, which allows you to put them in a lot more positions than most of the other chairs on this list. Our office also found the arms on the OM5 to be among the most comfortable on this list, currently holding a top four score for arm comfort. The biggest potential problem with the OM5 is the backrest comfort. Not everyone will like the way the PolyFlex feels. The backrest is not adjustable, other than being able to freely recline. You cannot lock it in place or adjust the amount of tension it takes to recline. This was an issue for some people in our office that felt it reclined too easily. It can be difficult to maintain an upright posture because it takes such little effort to recline. Overall, it is near the bottom of the list for our back support score. 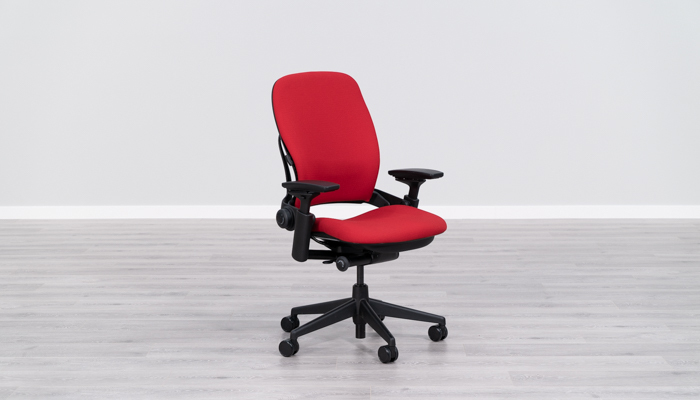 The iOO is one of the higher-end task chairs from Eurotech Seating. The chair functions with a synchro tilt mechanism and has a natural recline. It has a padded seat with a waterfall front edge. It features a mesh backrest that has two different sections. The lumbar section is separated from the top portion of the back so that it can act independently with the support it provides. The iOO received a good back support score because of the soft mesh and the lumbar support. The lumbar support is very pronounced, and the height adjustable backrest allows you to place it right in the curve of your back. The iOO is also highly adjustable. It has almost all the functions you would expect to see on an ergonomic chair. The high adjustability also applies to the arms. The arms have height, width, depth and swivel adjustments. One thing that may turn people away from the iOO is that the backrest does not go forward enough to sit fully upright. If you are looking for a chair that allows you to have a fully upright posture, then the iOO is not for you. The backrest’s tension adjustment is also very loose. Even at the tightest setting, it is still quite loose and takes almost no effort to make the back recline. Another thing that will be a problem for some people is that the seat height range is quite high. The minimum height is 20”, which is several inches higher than most of the chairs on this list. People that are 5’8” or under will need to use a footrest to have a good ergonomic posture with the iOO. The Affirm is a nice middle of the road chair from Office Master. It does not have the high-end components or design focused build like the higher ranked products, but it does have a lot of good things going for it without many glaring weaknesses. The chair features a mesh back design with a pronounced lumbar curve. The chair we tested featured the Executive Synchro mechanism which gives the chair a lot more adjustability than the standard mechanism. The Synchro Executive mechanism allows the chair to have a natural feeling reclining mechanism because the seat angle adjusts with the backrest angle. The arms also add to the adjustability of the chair because of their massive adjustment range. They are height and width adjustable. The arm pads also adjust in width, depth and they swivel. The Affirm is also a nice option for people that prefer a really thick padded seat. The cushion is about 4” thick and provides good support. The biggest drawback to the Affirm is that the minimum seat height is 19”, which is about 3” taller than the high-end task chairs on this list. This means that the standard version of the Affirm is not going to fit the 95th percentile. People that are shorter than 5’8” can try the 4” cylinder, instead of the 5”, but you may still need to go with a footrest. 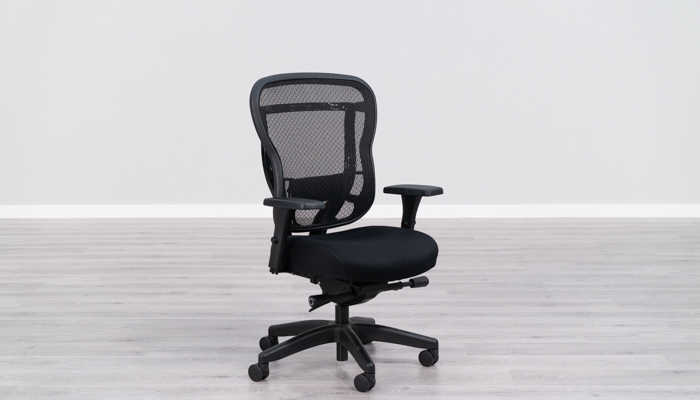 The Akir is a mid-market mesh ergonomic chair. It has a synchro-tilt mechanism and large mesh backrest with adjustable lumbar support. The best things going for the Akir are its high amount of adjustability and its overall comfort. The Akir has almost any function you would want in an ergonomic chair. This allows you to adjust the chair in a wide variety of ways to accommodate a lot of different ergonomic positions. The Akir did well with our comfort tests. The backrest’s lumbar support was received well in our office. It provides good support and can also be adjusted up or down to be placed right in the curve of your back. The Akir also received the highest seat comfort score on this list. The seat has three inches of padding that is not too soft or too firm. You do not sink way down like some thickly padded seats. It has some give and feels soft but also supportive. There are a couple things that may be potential deal breakers for some people. The first is that the build quality is not going to be on the same level as the high-priced chairs on this list. This chair is made in China so the quality of things like the mechanism and arm pads are more middle of the road to lower end. Another thing that may be a factor in your decision is that the arms do not go as low as other arms on this list. Some people like to have arms that go low enough to be out of the way and that is not possible with the Akir. The Akir also has a thick metal frame around the backrest. There are times when you lean back or want to stretch and you can feel the frame on your shoulders or arms. 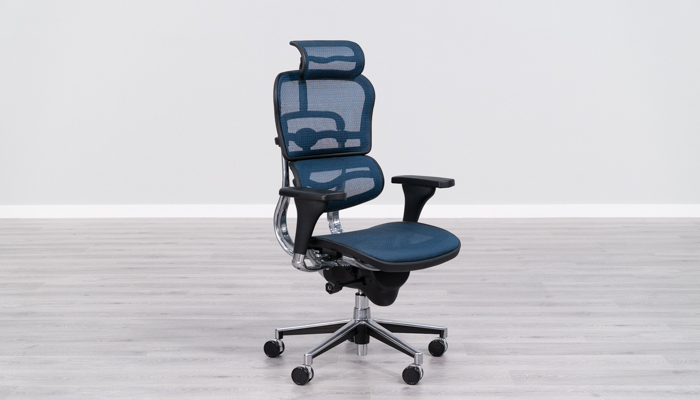 The Humanscale Liberty is a high-end task chair with a mesh back that features a natural lumbar curve. The chair was designed by Niels Diffrient and it is meant to provide automatic support with minimal adjustments required. The backrest features a tri-panel design with Humanscale’s Form-Sensing Mesh. The mechanism is meant to adjust with your weight as you are using the chair. As you recline, the back of the seat raises slightly to help support your hips. 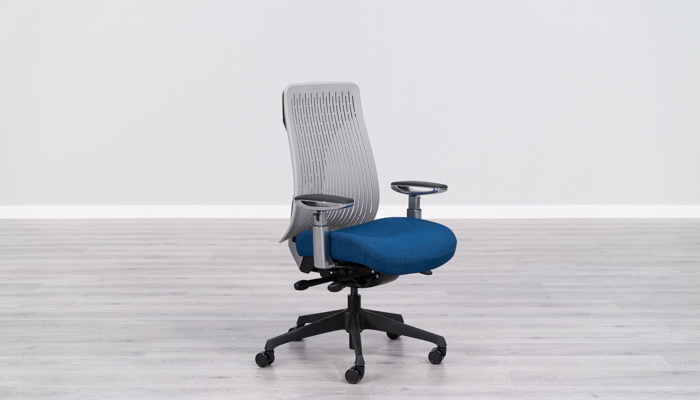 Like the Diffrient Smart chair, the Liberty is another option from Humanscale for people that are looking for a task chair but want something design focused. The Liberty features a sleek, minimalist, modern look and it comes in a wide selection of fabric patterns and types. The Liberty also has a seat that our office found to be comfortable. It has about 2” of foam but it is good quality and provides nice support. The seat comfort scored in the top portion of the chairs on this list. The biggest downside for people considering the Liberty is the overall lack of adjustability. This starts with the arms. The arms only adjust up and down and they are positioned wider than many other chairs we have tested. The Liberty also lacks lumbar adjustment, tilt lock or tension adjustment. The chair was purposely designed with only a few adjustments, but it seems to be a limiting factor on the range of people that can use this chair comfortably. Designed in China by Comfort Seating, the Ergohuman ME7ERG was one of the first mesh chairs to really challenge the Aeron Chair. When first introduced over ten years ago, the Ergohuman became almost an instant success story. 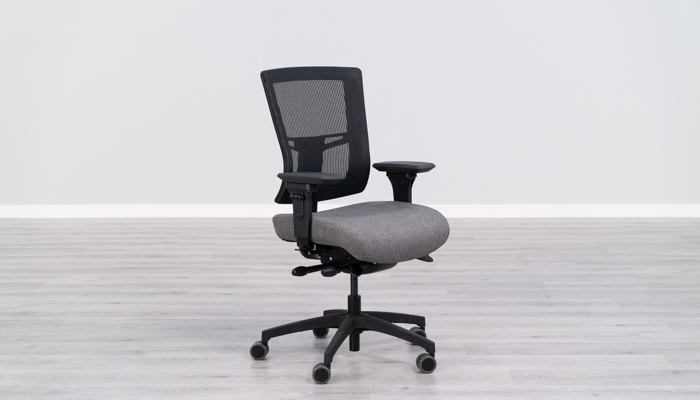 With a wide range of ergonomic adjustments, you can fine-tune the fit, unlike the Aeron chair. One of the biggest selling features, since its launch, is the lower lumbar system on the Ergohuman, which is still unmatched. With such pronounced lumbar support, users that tend to cheat while seated and lean forward remain in contact with the lumbar system. If you’re looking for a lot of lower support, this is the best chair available. Even though the Ergohuman arrives RTA (ready to assemble), it is still an easy product to put together. With only seven bolts to attach the backrest and arms, most users can expect to have it together in under 15-20 minutes. Eurotech provides a good warranty with their Ergohuman line-up, offering an updated weight capacity of 300 lbs. The parts like mechanism, frame and cylinder are covered for the life of the chair. The foam and upholstery are covered for a period of five years from purchase. While the ME7ERG is the overwhelming most popular model from the Ergohuman series, I don’t love the mesh upholstery. I’ve found that it is high quality and holds up well over time, but it doesn’t provide as good of support as the leather alternative found on the LE9ERG below. If you tend to slouch in your seat, the mesh can start to flex into your tailbone, causing discomfort over time. The mesh upholstery also creates uncomfortable touchpoints in the frame that you may notice in your shoulders and legs. While it’s not something everyone notices, it is a problem we’ve experienced throughout the years of selling the product. The last concern we have with the ME7ERG is the angle of the backrest, compared to the seat. If you prefer to sit straight up with the backrest at 90 degrees from the seat, the ME7ERG will not be a good option. By design, the upper back is slightly more than 90 degrees, requiring you to lean back for full support of the upper back. Designed in China by Comfort Seating, the Ergohuman LE9ERG was introduced at the same time as the ME7ERG. When first introduced over ten years ago, the Ergohuman LE9ERG didn’t get quite as much recognition as it’s mesh counterpart. With all of the same ergonomic adjustments as the ME7ERG, the LE9ERG is very similar, but not quite an exact replica. One of the biggest differences of the LE9ERG is how the seat and back are upholstered to the frame. This also happens to be one of the things that I really like about the chair. One of the first things you’ll notice about the sit is that it is much firmer than the ME7ERG. While it might not be great for everyone, it provides better support for long hours of sitting. If you’re looking for extreme lower lumbar support, the LE9ERG is the ticket. Because the leather upholstered backrest doesn’t flex like the mesh alternative, it pushes against your back sooner. Users who lean forward while typing at their keyboard will likely appreciate this the most. Like the ME7ERG, the leather option provides a good warranty, also offering the updated weight capacity of 300 lbs. The parts like mechanism, frame and cylinder are covered for the life of the chair. The foam and upholstery are covered for a period of five years from purchase. While I liked the seat and back cushions, the LE9ERG upholstered seat and back can be a little too stiff for some users. Fortunately, the leather upholstery and foam push you up higher on the seat and help to avoid the touchpoints on the frame users have noticed with the ME7ERG. 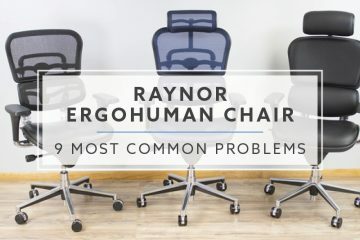 The Ergohuman series tends to sit a little tall compared to some of the higher-end brands. That too is the case with the LE9ERG and because of the seat padding, it sits even higher than the ME7ERG. With a seat height range of 19.3” to 24”, shorter users will want to consider adding a footrest to their workstation if they choose this chair. The Vera chair is a product from Eurotech Seating. It is a more affordable alternative to the higher-end Eurotech mesh chairs, like the Ergohuman and iOO. The Vera features a mesh backrest with a pronounced lumbar curve. It has a synchro-tilt mechanism, which keeps your seat in an ergonomic position while you recline your backrest. The backrest has tension adjustment and allows you to lock it into three different positions. The Vera tested well in our office. It received one of the highest seat comfort scores. The seat has thick padding and a slight contour, which provides good support. The backrest on the Vera currently has the highest back support score on this list. The mesh flexes nicely to allow you to sink into it a bit. The flexible mesh is also nice in the lumbar section because it provides good support based on your weight and back shape. The arms also received a top end score for armrest comfort due to their high adjustability and rounded edges. The Vera chair is not going to have the same level of build quality as the chairs placed higher on this list. This product is made in China and features some mid-range parts. One area that this shows is the quality of the mesh. The mesh on the Vera is more abrasive than higher-end chairs and we have found that fuzzy types of material from clothing can often come off onto the mesh. Tighter woven clothing doesn’t have the same issues. The Vera is also probably not the best choice for short people because the minimum seat height is about 2” higher than the preferred height to fit the bottom 5th percentile of people. We found the same thing to be true for the minimum arm height and could pose an issue for users under 5’2″. 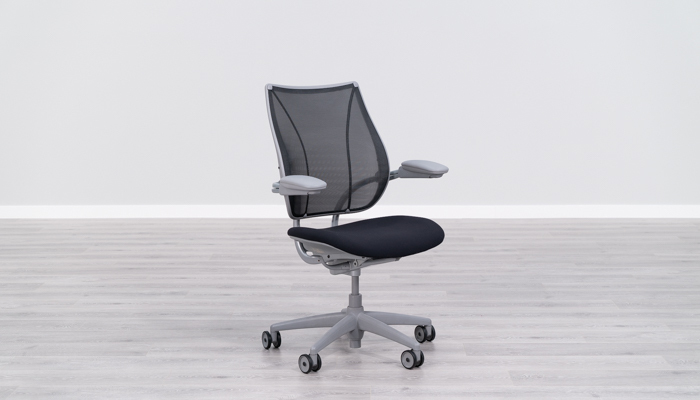 The Viper is a mesh back task chair by Valo Furniture. It features a synchro-tilt mechanism with tension adjustment and multiple position tilt lock. The chair recline feels nice and the arms come with you as you recline, which helps to keep you in a good posture at all times. The backrest is made of breathable mesh and has a large curve toward the top of the backrest. The Viper comes with a nice lumbar adjustment system. The lumbar pad is height adjustable and the pad is soft, so it feels nice against your lower back. The Viper has a handful of downsides that we found while testing the chair. The Viper received one of the lowest seat comfort scores. This is because the seat is quite firm compared to many of the other chairs. The frame was also an issue for seat comfort because there are times that you can feel the metal frame on the back of your legs. The armrests are another concern because they also received a low comfort score. This is mainly since they are not width adjustable and sit farther apart than many people in our office preferred. Having your arms at an outward angle is not recommend for a correct ergonomic posture. Our final major concern is that the Viper received a low back support score. This unit has a nice adjustable lumbar system, but it still received a low back support score. This is because the backrest forces you to sit back quite a bit, even in the full upright position. The large curve at the top of the backrest makes it difficult to get it to support your upper back and shoulders. One of Eurotech’s workhorse chairs, the 4×4 series is still a bestselling line for them. The 498SL is the more adjustable option for the series, adding in a sliding seat component for a better fit across different bodies. 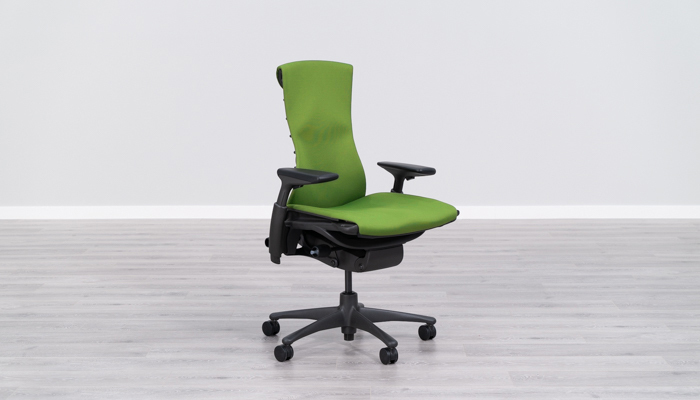 The 498SL is the only chair in our list to include infinite tilt lock function. This means users can pick any reclined position and lock it into place for more comfort. It was also one of the few chairs to include a forward seat tilt function, which can be awkward for most, but some computer users love. Eurotech has beefed up the five-star base on the 498SL, with steel construction that is unlikely to break with the 275 lbs. capacity. This lower priced chair also comes with a good warranty for the price. Coverage includes life on all parts and five years on the foam/upholstery. One of the biggest issues we’ve found with the 498SL is the size of the chair. If you’re over 6’ tall, or heavier than 220 lbs, the chair might be a bit on the small side. While the backrest is height adjustable, the chair isn’t wide enough and the back has a curved shape that can be restricting. While the 498SL had a ton of ergonomic functions, the armrests were a big miss. With only basic height adjustable arms, users that want some more flexibility here will be a bit disappointed. The LQ-2-BK-GG is a chair from Flash Furniture that features a mesh backrest and synchro-tilt mechanism. It is rated for 24 hours use and has a weight capacity of 350 lbs. It has an adjustable lumbar system and four-dimensional armrests to give you several different arm positions to choose from. The seat is probably the best feature on the LQ-2-BK. The seat received one of the highest seat comfort scores on this list. It has 3” of padding and a suspension system. The seat has a bit of bounce to it and doesn’t feel like a typical seat because it feels more like you are floating on top of the seat than sinking into the foam. The LQ-2-BK-GG is made in China and is going to be on the low end of the build quality scores for chairs on this list. It does not have high-quality components and the chair comes with a short two-year warranty. While the arms have good adjustability, they received a low score for comfort because the pads are hard. Another concern with the LQ-2-BK-GG is that it will only fit a small range of people properly. The seat height only goes as low as 20”, which is 4” taller than the high-end chairs on this list. The arms also only go as narrow as 20”. That is pretty wide compared to most of the chairs on this list that have arms that can get as narrow as 17” or less. The LQ-BK-GG is best suited for big and tall people that weigh 350 lbs. or less. Only rated for 250 lbs. 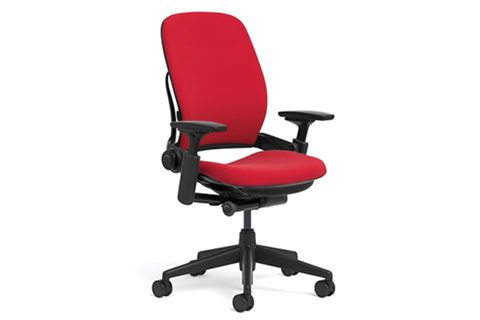 As the least expensive option in the list, the 100MC chair does a lot well for the price. Naturally, the price point is one of the most obvious things we liked about this chair. The 100MC does have a few ergonomic adjustments. The three-position tilt lock function is something that is commonly found on chairs 50% more expensive. It also includes arms that are height and width adjustable to do some customizing for different size users. As the least expensive product on the list, we do have to temper some of our expectations. The 100MC is far from perfect and the jump to the high-end products in the list is significant. Build quality is likely one of the most obvious differences that all people would notice. Made in China, the fit and finish of the 100MC were at the bottom of the list when compared to more expensive chairs. 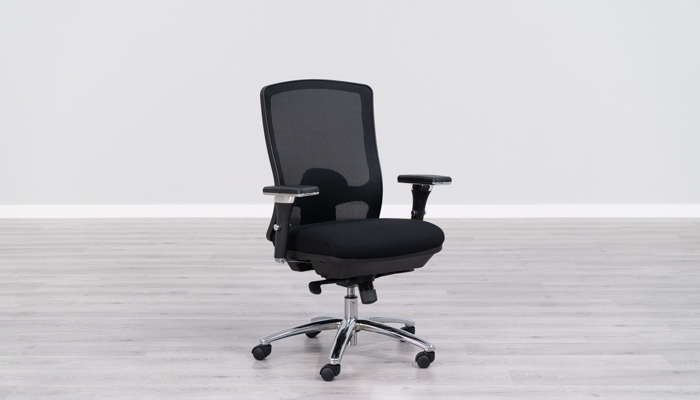 While the 100MC chair comes with some ergonomic adjustments, things like a seat slider and 4D arms are the most noticeable missing components. The seat can also sit a bit firm for some users, so depending on your preference you may want to avoid this chair because of the seat. Lastly, the 100MC comes with a pretty good warranty, with lifetime coverage on parts and five years on foam/upholstery. Unfortunately, the weight capacity is one of the lowest on the list at only 250 lbs. The GO-99-3-GG is a mesh back big and tall chair from Flash Furniture. It is rated for 24-hour round-the-clock use that is capable of supporting people up to 500 lbs. It features a large, 5” thick padded seat that provides good support. 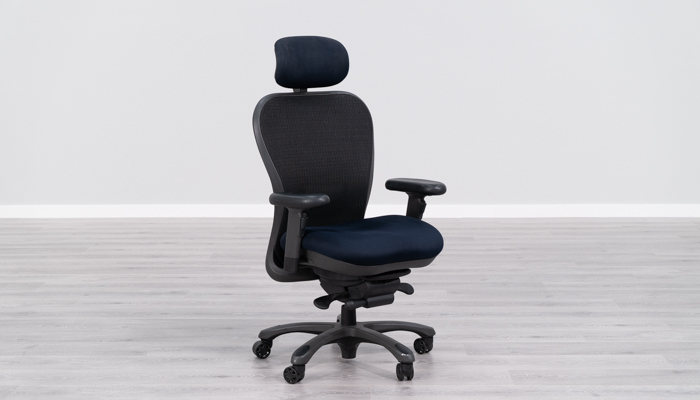 It also has a large backrest that is height adjustable and features a lumbar support system that can be adjusted to give less support or more support, depending on what you prefer. The GO-99-3-GG is coming out of China and has a low-end build quality. On this chair you have a basic swivel tilt mechanism so the rocking motion doesn’t feel as smooth as the other chairs on this list with synchro-tilt or knee tilt mechanisms. It takes more effort to rock and your knees will move up with the front of the seat. The low-end build also means that this chair comes with a short warranty length of two years. The GO-99-3-GG will only be suitable for big and tall people. The chair is wide, with 22” between the armrests. This is quite large compared to the standard sized chairs on this list. If the armrests were adjustable, then you may be able to make the distance smaller to accommodate more people, but the arms are only height adjustable. Another reason why this chair is meant for big and tall people is that the minimum seat height is taller than the minimum seat heights found on standard chairs.